Daimler has dropped the hammer on its newly-refreshed Mercedes Benz M-Class lineup. There's actually not a whole lot of news here other than a restyled nose and tail, fresh interior materials, and two new safety features called "PRE-SAFE" and "NECK-PRO", which despite the capital letters sound pretty boring to us. What we are amused by is the insistence of the press release in calling the M-class an "off-roader". Look, we know it can go off-road, but the M-class has about as much chance at seeing the Moab as a can of corn has of doing calculus. Full press release below the jump. Stuttgart - Mercedes-Benz has meticulously revamped the successful M‑Class. The new generation of the dynamic, stylish SUV now has even more distinctive characteristics, and looks even sportier and more powerful. The front end of this off-roader is now defined by a redesigned bumper, recontoured headlamps and a larger, even more dominant radiator. The rear view also sports a new-look bumper with integrated reflector strips, emphasizing the vehicle's width, as well as tails lights with a smoked-glass look. Stylistic fine-tuning and new high-grade materials which are pleasing to the eye and touch combine with a new two-tone color scheme to add fresh highlights to the interior. Moreover, the eye is immediately drawn to the new four-spoke multifunction steering wheel. The M-Class standard specification has also been significantly upgraded. It now includes the unique anticipatory occupant protection system PRE-SAFE® and NECK-PRO head restraints as well as an all-new, high-performance telematics system developed by Mercedes-Benz, which is much easier to use thanks to a host of new functions. The Mercedes-Benz ML 63 AMG is also set to become even more distinctive and striking, courtesy of new front and rear aprons with a chromed underguard, and a larger AMG radiator grille. The Mercedes-Benz M-Class is the trend setter among today's SUVs. Its exceptional status is down to its characteristic dynamic, stylish design, a combination of compelling performance both on and off-road, the ride comfort and ease of operation of a saloon, along with a high perceived value. The M-Class also comes with a range of safety features that are unsurpassed in the SUV segment. Buyers have also come to appreciate these outstanding qualities. Since the second-generation M-Class was launched in April 2005, some 300,000 units have been delivered to customers around the world. As such, the state-of-the-art off-roader remains one of the most successful vehicles in this rapidly growing market segment. Mercedes-Benz has now substantially upgraded the new-generation M-Class with fresh styling touches, even higher quality and extensively enhanced equipment and appointments. The premium SUV now looks even more powerful and sportier, making a bolder statement in terms of character and presence. The assured appearance of the M-Class is now marked by its dynamically flowing, yet at the same time crisp lines and a clear, powerful design idiom. Thanks to the new-look front-end as well as the modified rear, the new-generation M-Class looks more muscular yet brings a sense of aesthetic elegance to bear - in short, it has even more style. The front end is dominated by a new-look, robust bumper as well as headlamps with a pronounced step in the lower edge. This step continues seamlessly down and around the radiator with its distinctive contours. The larger, lower-set radiator is another element brimming with character. Three wide, black louvres with large, rectangular air outlets and a gleaming chrome edge give structure to the radiator, making the new-generation M-Class appear even more dominant. Fog lamps set well to the outside and a new-look simulated underguard make the off-roader appear wider and even more dynamic. The rear bumper with integrated reflectors has also been restyled, making the M‑Class appear even more poised and assured for anyone following behind. The optional stainless steel underguard conceals the exhaust system with its twin tailpipes and also gives the car a wider stance on the road. The reversing lights also feature darkened indicator repeater lenses in a smoked-glass look. Roof rails are now also included as part of the standard-fit styling and practical features, along with the new powerful mirrors with their larger surface designed to provide better visibility. The interior of the new-generation, state-of-the-art off-roader has been stylishly upgraded with high-quality materials. The door centre panel is now trimmed in ARTICO man-made leather. Two-tone leather appointments are also available as an option to give a hand-made impression. In the enhanced interior the eye is also drawn to the new, four-spoke leather multifunction steering wheel with its chrome trim, improved ease of operation and standard-fit shift paddles. The seats have a more attractive, sportier design and can be fitted with four-way lumbar support as an option. The new-generation M-Class features a brand new telematics generation developed by Mercedes-Benz, offering a new dimension in user-friendliness, high performance and a host of useful new functions. Integrated features include a hands-free system based on Bluetooth technology, and an aux-in connection for mobile audio devices such as an iPod. On request there is also a new Media Interface, which can connect an external music device with the off-roader's onboard electronics and control system, enabling music tracks to be shown in the instrument cluster and the colour display in the centre console, and conveniently accessed using the buttons on the multifunction steering wheel. At the same time, the audio device's battery is also charged. There is a choice of three units, all of them with a colour display, a twin tuner for improved radio reception, speed-sensitive volume control, a keypad for entering telephone numbers and radio frequencies and a Bluetooth interface which enables a mobile phone to be wirelessly linked to the hands-free system. Along with the new telematics generation, Mercedes-Benz also is now also offering enhanced LINGUATRONIC voice-operated control system as an optional extra in the M‑Class for the first time. The occupants are also able to enjoy a surround-sound experience of concert hall quality with the latest generation of the optional Harman Kardon® Logic7® sound system, which delivers exceptionally crystal-clear listening pleasure thanks to its output of 610 watts and digital signal processor (DSP). Rear-seat passengers also have the option of a new entertainment system with two large 8-inch screens, a centrally integrated DVD player, two sets of wireless headphones for greater freedom of movement as well as two remote controls. Unrivalled safety features as standard. The Mercedes-Benz M-Class has always set the benchmark in terms of safety in the SUV segment. In future it will also come as standard with the anticipatory occupant protection system PRE-SAFE® and NECK-PRO head restraints. Fuel consumption reduced by up to 0.4 litres per 100 kilometres. The M-Class is powered by powerful yet economical V6 and V8 petrol or diesel engines, which are now even more fuel-efficient. The 4MATIC permanent all-wheel drive delivers outstanding performance both on and off-road. And the standard-fit 7G-TRONIC automatic transmission with optimised shift characteristics translates the power from the engines into refined dynamism. Five units are available in the new-generation M-Class ranging from 140 to 285 kW (190 to 388 hp). The engineers' meticulous attention to detail has reduced fuel consumption by up to 0.4 litres per 100 kilometres compared with the outgoing models. Moreover, the most powerful engine developing 375 kW/510 hp is available in the guise of the ML 63 AMG 4MATIC. The Mercedes-Benz ML 63 AMG now demonstrates even more emphatically its exceptional status as the performance SUV with the largest displacement and highest output. The new AMG front apron is an eye-catching feature with its high-gloss, chromed underguard. The lower cooling air inlet appears even larger thanks to the central black grille. New-look headlamps flank the equally new AMG-specific radiator grille: painted in high-gloss black, its three radiator louvres feature chrome highlights. Round fog lamps set well to the outside with chrome surrounds and the flared wheel arches in the body colour make the flagship M‑Class appear even wider and more muscular. Even more unmistakable, even more powerful: this philosophy is also continued at the rear. The high-gloss, chromed underguard is the undoubted highlight on the equally new AMG rear apron with integrated reflectors. Further visual highlights include the two chromed twin tailpipes on the AMG sports exhaust system. The dark-tinted tail lights are replaced with LED tail lights with their clear-glass look if the optional bi-xenon headlamps are specified. New-look exterior mirrors as well as the standard-fit aluminium-look roof rails add the finishing touches to the styling modifications. Viewed from the side, the new 20-inch 5-spoke AMG light-alloy wheels make a bold statement. Painted titanium grey with a high-sheen finish, the 10-inch tyres are shod with 295/40 R 20 tyres front and rear. An even more impressive wheel/tyre combination is available as an option: titanium-grey-painted, high-sheen 21-inch AMG light-alloy wheels with the new twin-spoke styling are shod with 295/35 R 21 tyres. The new AMG ergonomic steering wheel stands out in the practical, high-quality interior of ML 63 AMG: perforated leather adorns the specially shaped grip area, while the bottom two spokes are finished with a silver-coloured insert. New AMG aluminium shift paddles allow the driver to shift gear manually. A nappa leather-trimmed dashboard is also available as an option. The new telematics generation also features in the M-Class. The Audio 20 fitted as standard in the ML 63 AMG combines ease of use and logical menu structure with consummate entertainment. A hands-free system with Bluetooth technology comes as standard and a new Media Interface in the glove compartment is available as an option, which enables mobile audio devices such as the iPod to be fully integrated and then controlled via the audio system's user interface. Mercedes-Benz also offers the optional enhanced LINGUATRONIC voice-operated control system with its hallmark outstanding functionality in conjunction with the new telematics generation. With a maximum output of 375 kW/510 hp at 6800 rpm the ML 63 AMG remains the most powerful off-roader on the market two-and-a-half years after its launch. The AMG 6.3-litre V8 engine develops maximum torque of 630 Nm at 5200 rpm from a displacement of 6208 cc. In essence, this superior engine delivers top-notch performance. 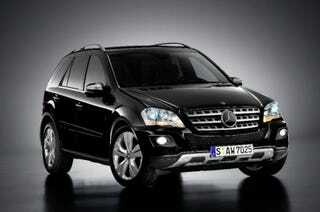 The ML 63 AMG accelerates from 0-100 km/h in 5.0 seconds, top speed is 250 km/h (electronically limited). Power transfer is via the AMG SPEEDSHIFT 7G-TRONIC automatic transmission with three drive modes. The permanent all-wheel drive is decidedly sporty: the power is split asymmetrically 40:60 between the front and rear wheels to provide optimum agility. The AMG sports suspension based on AIRMATIC guarantees dynamic performance combined with the hallmark Mercedes long-distance comfort. The air suspension features AMG-specific damper struts and the specially configured adaptive damping system ADS including automatic level control all-round. Both the dampers and springs instantly respond as the current driving situation changes, but their settings may also be adjusted manually in three stages at the touch of a button. The generously dimensioned AMG high-performance braking system, which features internally ventilated and perforated brake discs all-round, guarantees the shortest possible braking distances and optimum resistance to fading. The standard specification of the ML 63 AMG includes electrically adjustable AMG sports seats with nappa leather upholstery, Alcantara inserts in the shoulder areas, multicontour function and heating. The AMG instrument cluster comes with a specially designed AMG main menu with gear indicator, recommended upshifts, as well as engine oil temperature and battery voltage display. The integrated RACETIMER enables the driver to record lap times on a racing circuit.